These timeless retail clothing displays are truly a staple for many boutiques and small businesses. If you’ve ever wondered how to assemble a dress form, then this infographic is for you! 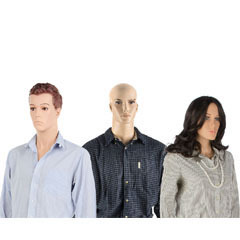 Mannequins may not be able to speak, but they still manage to say a lot...We'll cover the different styles that are available and how those styles are perceived by consumers. For retailers who sell clothing folded up on shelves or displayed on hangers, what's the next logical step for engaging customers towards making a purchase? Store mannequins add a dose of reality, so to speak. Using them allows shoppers to see how an article of clothing actually rests on the body, providing visual clues that spark an emotional reaction (want/need) in the shopper. 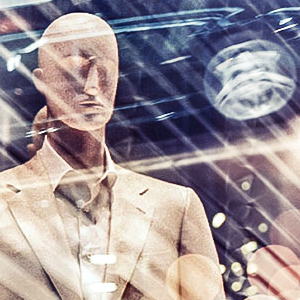 In addition to their use as a sales tool, retail store mannequins also add flourish to the overall interior decor, whether displayed in storefront windows or used as a centerpiece inside a department store. We must point out what these figures are not - articulated manikins, anatomical teaching models, or dressmaking dummies. 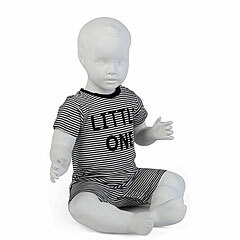 All our store mannequins are designed for display purposes only. Most models are manufactured from lightweight, durable plastics for easier handling while moving, dressing, or storing. 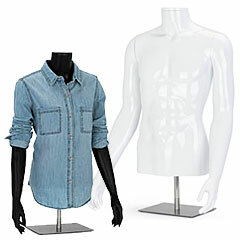 What styles of male or female clothing figures do we have to offer? Full Body store mannequins are just what the term implies. Models are broken up into two main categories: realistic or abstract. 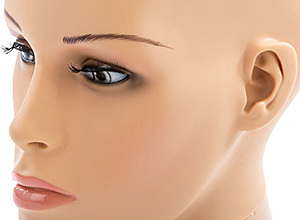 The realistic figures feature fleshtone finishes, subtle makeup, and life-like eyelashes which makes them ideal for department stores. 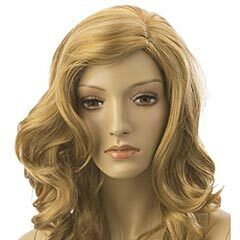 Abstract mannequin forms come with simplified facial features (or none at all) in white, black, or bronze colors. The high gloss finishes are an excellent choice for upscale boutiques or edgy emporiums. Without a pair of eyes looking back at you, attention is diverted from the abstract model to the displayed clothing. Both styles are available in a wide variety of poses, including standing, running, or sitting. Additionally, all upright poses come with tempered glass floor plates and calf rod supports. Half Body forms typically feature just the upper torso or legs which are attached to a rod for table or countertop display. These are available in many finishes from clear to flesh-toned. 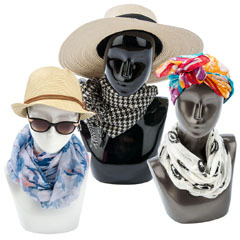 We also sell an assortment of heads for displaying headwear, scarves, or sunglasses. Padded Dress Forms offer yet another possibility for the display of clothing and accessories. 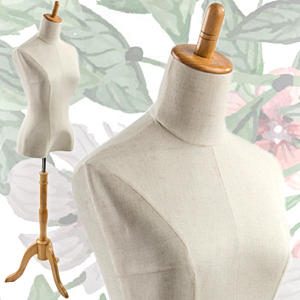 Directly inspired from professional tailor dummies, these (non-pinnable) fabric-covered torsos feature traditional designs mounted to wooden display stands. Despite the many different types of materials involved with their construction, these padded dress forms are some of our most affordable styles. Applying these merchandising tools in your establishment takes some planning. As evidenced by the appeal and popularity of storefront window displays seen in the big city, the opportunity is there to create something special and unique for your store. 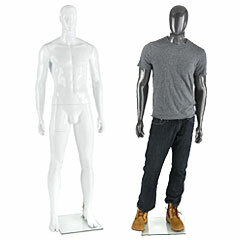 Retail clothing dummies not only help move merchandise, they reinforce your store brand. An intriguing and memorable window display enhances new product roll-outs, seasonal sales, and other promotions that keep your business fresh in the eyes of passersby. If these figures form the base layer of your marketing plan, consider building the second layer with hanging graphics and other promotional props for adding atmosphere to your show room. Color is important, too. Go with a splash of several high-impact hues, or choose a monochromatic colorway for a more understated and upscale presentation. 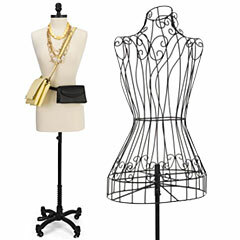 There's nothing more effective than a fashion mannequin for bringing your strategic marketing vision to life!